Everyone readily admits that Uzeyir Hajibeyov (pronounced oo-ZEH-yeer hah-jee-BEY-ov) was a genius. If you ask the reason why, some would say it was his pioneering spirit-his ability to forge paths where no one had ever trod before. And some would point specifically to his first major work, "Leyli and Majnun" (1908), which was the first opera not only in Azerbaijan but also in the entire Muslim world. Others would credit his vision in synthesizing eastern traditional elements (melody, mode and instruments) with western style and form (for example, symphony andm opera). Or they would applaud his foresight in insisting that Azeri folk music could and should, indeed, be transcribed via European musical notation. Written scores, in turn, helped to establish the legitimacy and continuity of our own folk music. Some would single out his pedagogical and administrative talents that led to the creation of numerous fundamental institutions such as a composer's school, a folk instrument ensemble and other educational forums which still exist today.Others would admire his ability to walk the tight line between his own independent spirit and one highly controlled by a dictatorial authorities. Despite these enormous achievements, in my opinion, Hajibeyov's true genius lay in the fact that he was the person most responsible for inviting the great musical minds to come to Azerbaijan, especially between the years of 1920-1940. Hajibeyov brought the brains to Azerbaijan. And this simple act enabled our nation to make incredible leaps in the development of our music. It's true that we had been performing music for centuries, even millennia. But most of our music had been passed down through oral tradition. When Hajibeyov came along, so little of our music had been written down in European notation. With superb trainers at the helm of our educational system, we went from what might be called "zero level" to being able to compete at world class standards in a very brief period of about 30-40 years. As a professional musician, I'm convinced that such progress in the life of a nation normally takes between 150-200 years. But we did it in an incredibly short period of time. In Azeri, we have an expression, "squeeze the time." Hajibeyov's vision enabled us to "squeeze the time" and excel in music. 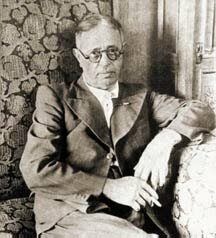 Photo: Hajibeyov in 1948, the year he died in November. Such a leap had never occurred in any other single country-both in terms of quality and quantity. I have visited numerous countries, attended many festivals and met many of the world's great musicians, and they're always amazed to discover the high caliber of Azerbaijan's music. To me, this is the greatest legacy of Hajibeyov. This was the true nature of his genius. This tireless visionary didn't just bring a couple of professional musicians to Baku. He brought tens of them. At that time, some of the most well-known conservatories in the world, Moscow and New York included, were trying to attract these experts to their own schools. But Hajibeyov managed to bring them to Baku. Many of them were among the most popular masters in the world at that time. Let me offer a few names. First of all, there was Giorgi Sharoyev, the grandson of Anton Rubinstein (1829-1894), the renowned Russian pianist, conductor, composer and pedagogue, who came from Moscow to Baku's piano school and stayed for the rest of his life. Then there was Brenner, the pianist, and Zeidman, the well-known composer. Chumakov, Bifstein and Danilov came to teach theory. Amiton taught violin and Brittanitski vocal music. Turich played cello as did Leopold Rostropovich, the father of Mstislav Rostropovich, who grew up to be the most well-known cellist of the century [the Rostropovich family moved to Moscow in 1931 when Mstislav was four years old]. Nor should we forget the impetus and energy that came when Russian composer Reinhold Gliere (1875-1956) came to explore Azeri folk melodies and modes which culminated in the creation of the opera "Shahsanam" (1934). True, it was Shovkat Mammadova, the opera singer, who had invited him, but Hajibeyov's influence was clearly part of the equation. Later on, during the Soviet period when travel was restricted, oil money played a significant role in attracting some of the finest musicians to perform concerts in our country. Unlike other republics, we had oil and could pay in foreign currency for very famous world musicians to perform with our Symphony Orchestra. Musicians such as the violinist Isaac Stern and pianist Van Cliburn came in the 1960s. And the list goes on and on. I was 14 when Hajibeyov died. I never really had a chance to know him or study with him. But every professional musician in this country somehow relates to Uzeyir Hajibeyov. All of them have greatly benefited from his valuable insight. Even the next generation that follows us will be both emotionally and intellectually bound to him. It never matters how many articles you write about Uzeyir Hajibeyov; there would never be enough. There are very few people in the world like Uzeyir Hajibeyov, much less musicians, who have done so much for their nation. Truly, he made a revolutionary contribution to music in Azerbaijan. 1. During the 1920s after Soviet power was imposed in Azerbaijan, a serious controversy raged about whether traditional instruments should be retained or not. Some people wanted to adopt Western symphonic instruments and Western styles and totally abandon the use of the traditional stringed instruments like the tar. Such a decision would have had serious consequences for the continuation of mugam (modal) music in Azerbaijan. The controversy became so embroiled between 1927-29 that one poet, Suleyman Rustam, wrote, "Stop tar, stop tar, You're not loved by proletar!" Another poet, Mikayil Mushfig, countered, "Sing tar, sing tar! Who can forget you!" Fortunately, the tar and other traditional instruments like the zurna, kamanche, gaval and others were not prohibited or banned, and these instruments grew in populaity and beginning with Hajibeyov have been included in orchestral performances. For example, more than 20 concertos have been written for tar and orchestra. 2. Hajibeyov had been an activist in the Muscavat Party which opposed the Soviet takeover in Baku in 1920. In fact, he wrote political articles under about 60 different pseudonyms-first, criticizing the colonialist policy of the czarist regime and then afterwards bitterly attacking the Bolshevists. Most members of the Muscavat Party were arrested or killed when the Soviets took power. Hajibeyov was miraculously spared and even honored by the system that he loathed. Stalin, himself, attended the performance of Hajibeyov's opera "Koroglu" in Moscow (1938) and afterwards personally congratulated him, telling him to write "two couples more (meaning four)." Hajibeyov was awarded the Stalin Medal twice in his lifetime and, under the personal instruction of Stalin, was directly admitted into the Communist Party without being a candidate for membership-an extremely rare exception. Yet, still the composer lived in constant danger of being discredited as an "Enemy of the System." Arif Malikov (1935-) is one of Azerbaijan's most prominent composers. He studied under Gara Garayev (1918-1982), who was himself a student of the famous preeminent Russian composer, Dmitri Shostakovich (1906-1975). Shostakovich publicly acknowledged Malikov as his "musical grandson." In 1961 at the age of 26, Malikov wrote the ballet "Legend of Love," which has been performed in 64 theaters throughout the world [See AI 3.1, Spring 1995]. More recently, his "Seventh Symphony" was written and performed for the opening of the new $6.5 million Bilkent Conservatory in Turkey in January 1995 [See AI 4.3, Autumn 1996].